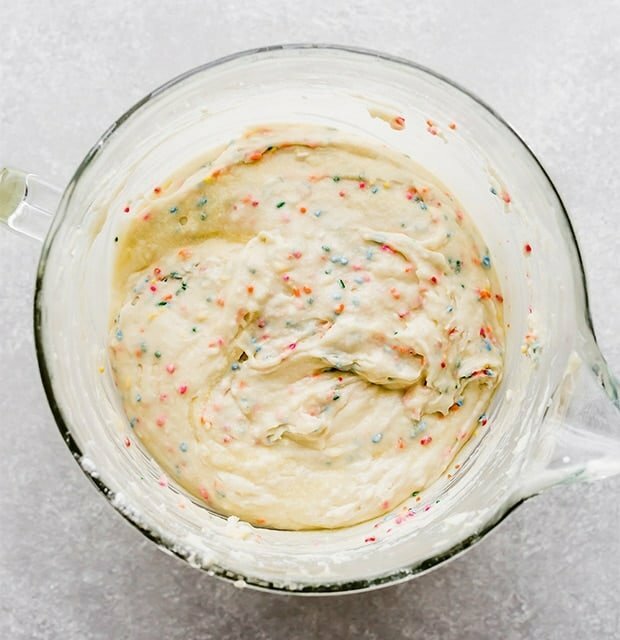 Funfetti Cake that tastes a MILLION times better than a cake mix! 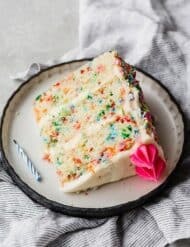 This homemade Funfetti Cake has a light and delicate crumb texture and is topped with a fluffy vanilla buttercream. How cliche is it to post a Funfetti Cake recipe on my birthday? It’s a bit over the top, but I don’t even care! 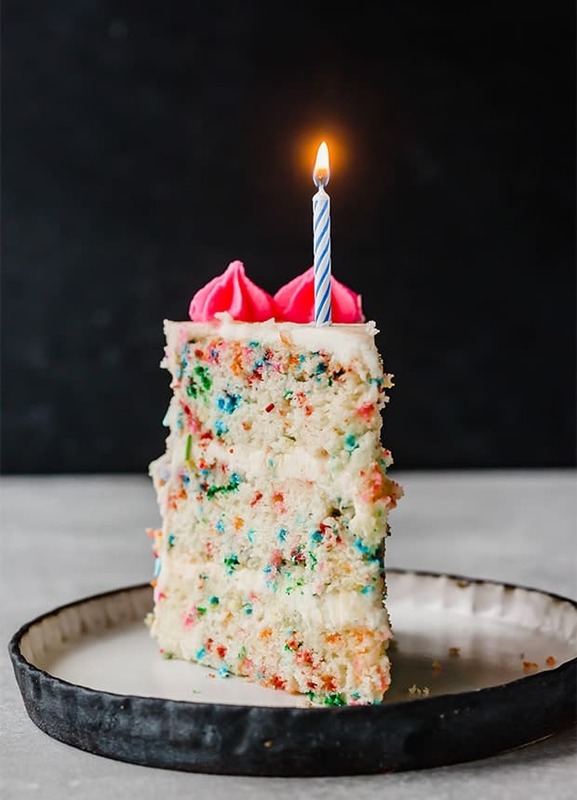 Now that I’m one year old, and wiser too, I’m choosing to share THE BEST Funfetti Cake with you! 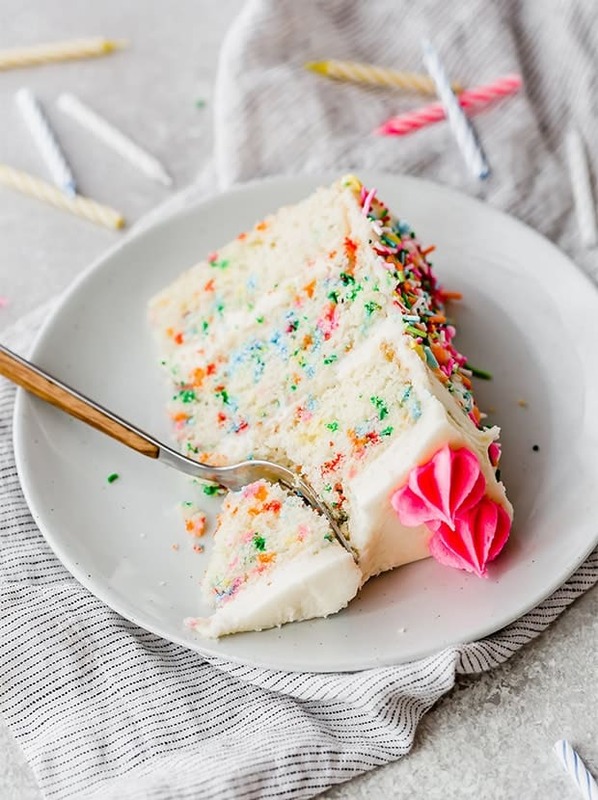 And in case you didn’t know, Funfetti Cake is like, the perfect birthday cake. I tested this recipe 3 times. Yes, 3! I was determined to get this recipe *just* right. And I did! 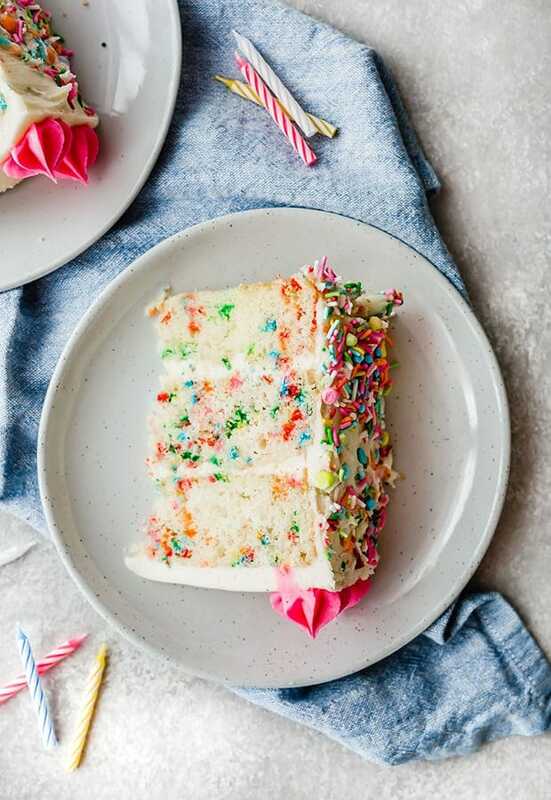 This Funfetti Cake has the perfect amount of sprinkles, the crumb is just right, and it’s mighty tasty! So tasty, you’ll NEVER make the dry and tasteless box cake mixes ever again. 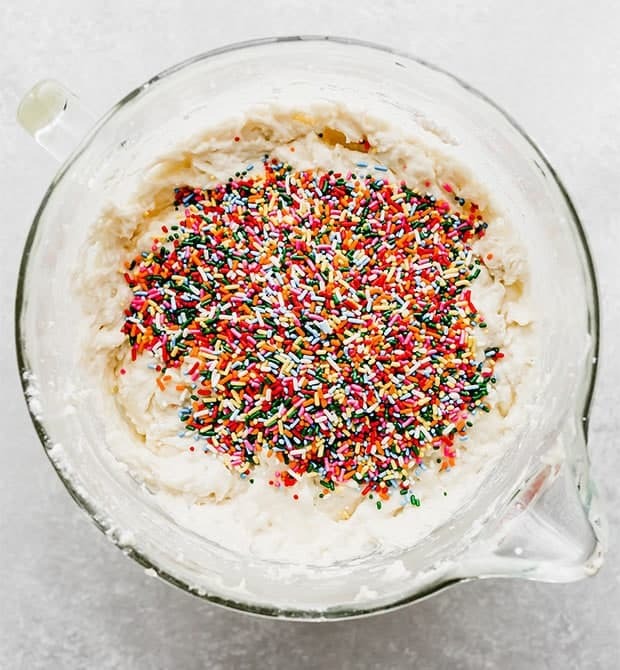 The secret to achieving the genuinely sweet and “Funfetti” taste is to use clear vanilla extract. For a show-stopping birthday cake, lets make a Funfetti LAYER cake! Begin by sifting the dry ingredients together. Sifting the ingredients allows the baking soda, baking powder, salt, and flour to FULLY and evenly incorporate. Plus it gets rid of lumps that might be in the flour. This recipe calls for CAKE FLOUR. I suggest you use cake flour. The protein content in cake flour is about 8% while all-purpose flour has a protein content of 13%. So ultimately, cake flour will give you a more light and tender cake. If you choose to use all-purpose flour I can’t guarantee the same result in the recipe. However, you’ll use 3 cups of all purpose flour rather than 3 1/4 cups + 2 Tablespoons of cake flour. In large bowl, or bowl of a stand mixer fitted with the paddle attachment, cream the butter and sugar for 2-3 minutes. The butter and sugar will appear fluffy and smooth. This is an important step in cake making! Creaming the sugar and butter pushes air into the mixture and aids in leavening the cake (making it rise). Next, add the eggs. You’ll do this one at a time. Beat for 30- 60 seconds after you’ve added each egg. With the mixer on low alternate adding the flour and buttermilk. So flour, buttermilk, flour, buttermilk, flour. Mix until JUST combined! Don’t over-mix cake. Add the sprinkles to the bowl and then gently fold them into the batter. It doesn’t take long for the sprinkles to be evenly distributed. If you get carried away and start mixing the batter too much, the cake batter will start to turn gray… not pretty! Evenly divide the batter amongst the 3 cake pans. PRO TIP: I use my kitchen scale to divide the batter amongst the cake pans. This is the best way to get even layers! I made this cake in 3 – 8 inch round cake pans. You could do this in 4- 6″ round cake pans. I haven’t tested the recipe with this cake size, so you’ll have to keep an eye on the oven to determine when the cake will be done. The cake is done when a toothpick inserted in the center comes out clean. Cool on a wire rack for 10 minutes and then turn the cakes out onto the wire rack and let them cool completely before frosting. 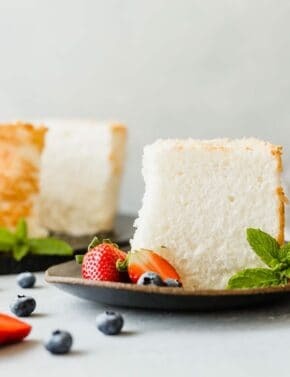 Bonus tip: This cake is DELICIOUS as is, however, if you’d like an extra moist cake, you can substitute some of the buttermilk for sour cream or plain greek yogurt. Do a straight substitution. This recipe calls for 1 3/4 cups buttermilk, so if you wanted to do the sour cream route I would try 1 1/4 cups buttermilk and 1/2 cup full fat sour cream. This will really up the moistness level… if you’re into that. ? I should note, I didn’t make this cake with sour cream, so do it at your own risk! But, I’ve made multiple cakes with either sour cream or greek yogurt and they turn out beautifully!! All that’s left is to make the buttercream. Simply cream the butter until light and fluffy about 2-3 minutes. Then add the powdered sugar, vanilla, salt, and heavy cream. Once the ingredients are added beat on high speed for another 2-3 minutes until the buttercream is fluffy and lighter in color. Add more heavy cream as needed. The consistency of buttercream should be thick yet easily spreadable. If you don’t have heavy cream, go ahead and use regular milk to make the buttercream. More cake recipes because… cake! Lemon Poppy Seed Cake from Cake Mix! – I doctored a cake mix and let me tell ya… it’s beyond amazing!! Sprinkles for the outside of the cake, not the exact ones, but a very cute mix! Cake pans – I love this brand! Electric Pink food coloring for frosting the top of the cake. I love this brand of food coloring. It’s gel, and the pigment is insane! You can find a handful of beautiful colors here. 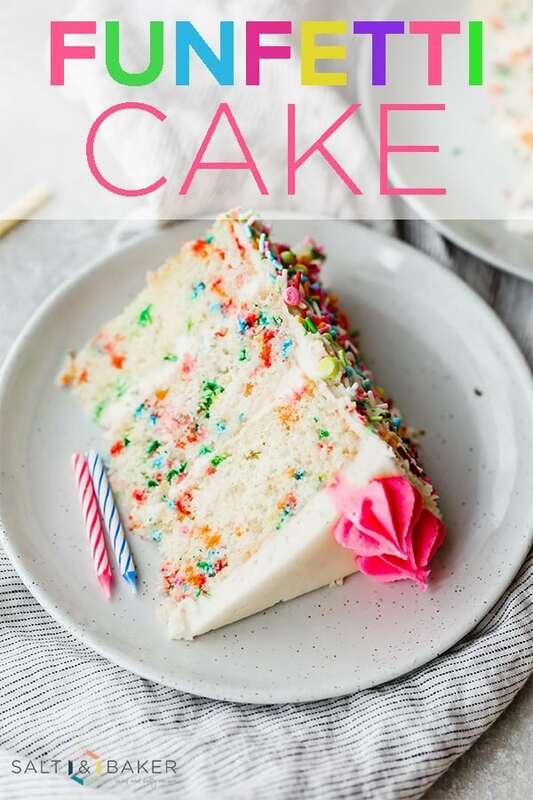 A delicious Funfetti layered cake, perfect for birthday and celebrations! This cake is loaded with sprinkles and topped with a fluffy buttercream. Sift the flour, baking powder, baking soda, and salt into a medium sized bowl. Set aside. Cream the butter and sugar on medium speed in a stand mixer fitted with a paddle attachment for 2-3 minutes. The butter and sugar will appear light and fluffy. Add the eggs, one at a time, beating after each addition for 30- 60 seconds. Scrape down the sides of the bowl as needed. Add the clear vanilla extract and mix until combined. 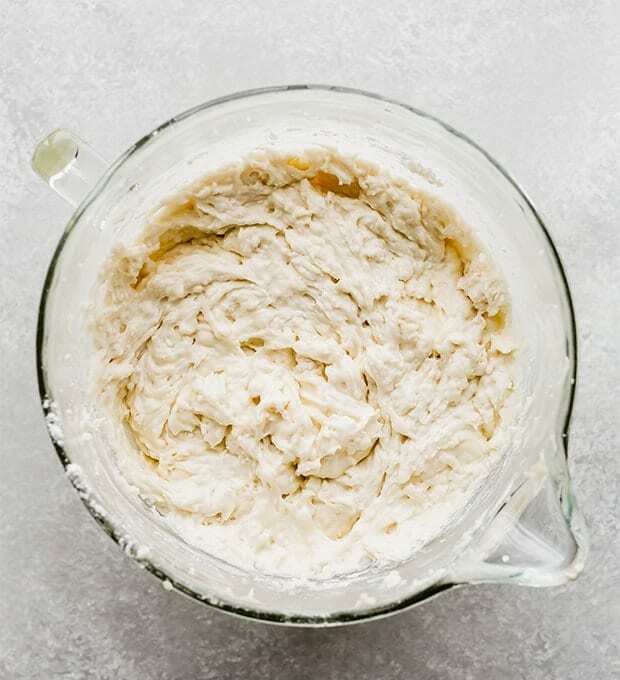 With the mixer on low, alternately add the flour mixture and the buttermilk, starting and finishing with the flour. Mix until just combined. Evenly distribute the batter amongst the 3 pans. Bake for 26-30 minutes or until a toothpick inserted in the center comes out clean. Remove the cake pans from the oven and set on a wire rack for 10 minutes. After the 10 minutes, turn the cakes out of the pans and allow to cool completely before frosting. In the bowl of a stand mixer fitted with the paddle attachment, cream the butter on medium high speed for about 2 minutes. Add the powdered sugar, vanilla, and salt. Mix. Add the heavy cream 1 T. at a time, until you reach your desired consistency. To assemble. Place a generous amount of frosting on one of the cakes, spread until it's in an even layer. Add a second cake to the top of the frosting. Add a generous amount of frosting to the top of the cake and spread until the top of the cake is evenly covered. Finish by placing the third and final cake atop of the frosting. 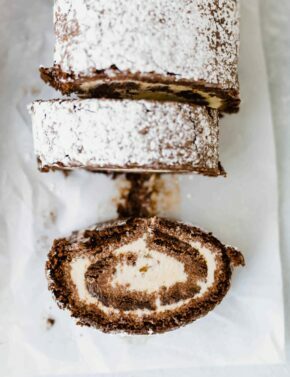 Do a thin crumb coat on the top and along the outside of the entire cake. Place the cake in the fridge (or freezer) for 15 minutes to set the crumb coat. Remove from the fridge or freezer and add the remaining frosting to the top and sides of the cake. Add sprinkles or additional decorations. Some of the links above are affiliate links, which pay me a small commission for my referral at no extra cost to you! Thank you for supporting my website! Happy Birthday Whitney!! This cake looks like the PERFECT way to celebrate! Thanks for sharing such a great recipe! I’ve never baked a cake before but am going to give it a shot next week for my dad and father in laws birthday party! 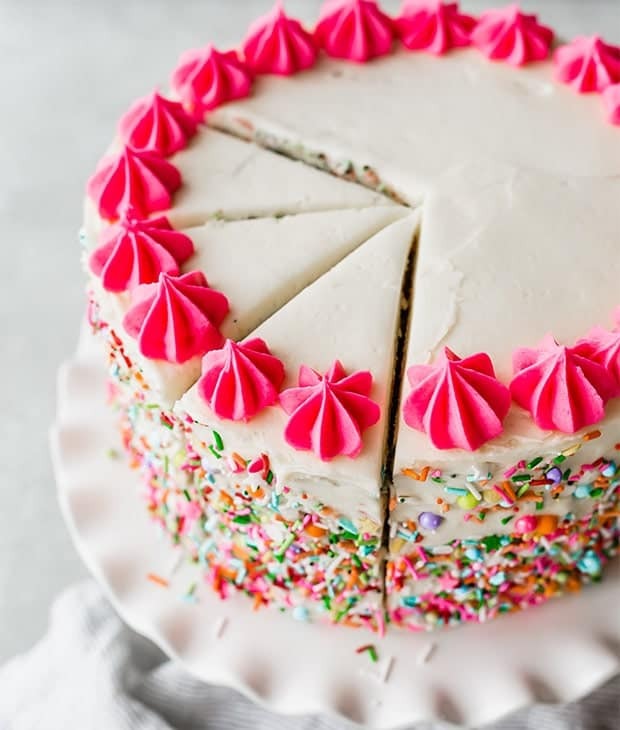 Which sprinkles did you use inside the cake? Thank you! I use the Wilton rainbow jimmies. You should be able to find them at your grocery store near the frosting and cake mixes. They come in a small plastic tub. I hope your father and father-in-law enjoy the cake!! This recipe was delicious, not dry at all. I’ll definitely be making this again, but one question – how do you get the sprinkles on the sides of the cake like that? It’s probably really obvious, but I couldn’t work it out! Glad you liked the cake! To get the sprinkles on the side of the cake you have to put the sprinkles on right after you frost the cake. 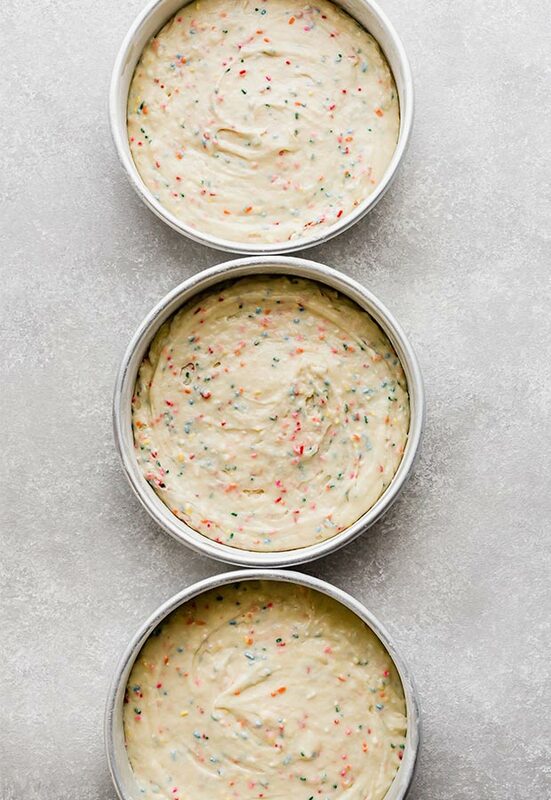 You have a handful of the sprinkles in your hand and you gently press your hand onto the frosting. 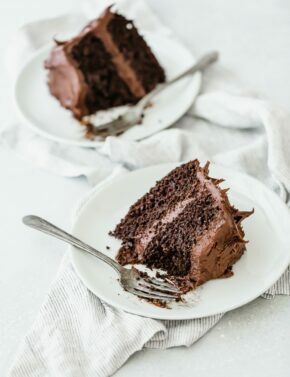 It’s best to have the cake on a plate or baking sheet so that you can pick up the sprinkles that don’t make it into the frosting, and try again. I hope this is helpful!